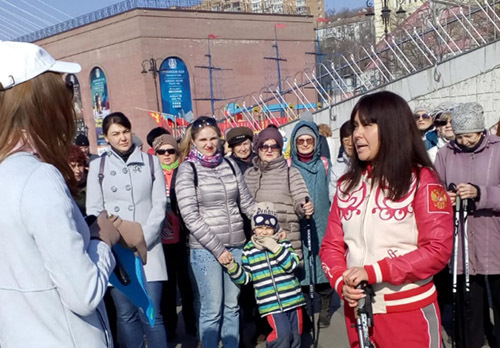 The Sixth Far Eastern "Sorochynsky Fair" was held on Vladivostok embankment. People in Slavic national costumes have been dancing, singing and sharing good mood with all the guests. All the visitors of the festival could buy intricate things made by Slavic craftsmen. Familiar Russian, Ukrainian and Belarussian folk themes could be heard during the festival. Hearing the music, people start dancing. Even though most of the guests are familiar with traditional Slavic dance moves, still not many can repeat all of them. National costumes are highlight of the event. Right here, at the festival, you can see beading craftswomen. They are absolutely sure, that national costumes will never be out of fashion. Not only folk costumes can be seen during the festival, craftsmen also represent felted footwear here. It appears that such footwear can be worn at all times of the year. All the guests had a chance to buy a charm that wards off evil spirits. Such charms are very popular among superstitious people. This year Far Eastern "Sorochynsky Fair" gathered lots of people in the center of Vladivostok. “Ukrainian Culture Center n.a. Anatoly Krill” organized this splendent fair to the citizens and guests of Primorsky region. The first Slavic festival was organized by them six years ago in Ussuriysk city and now it became well known all over the region. Vladivostok city Administration sponsored this year event. People in the audience can't take their eyes off of the concert show. More than 50 ensembles of Primorsky region have shown their best compositions during Slavic Fair. About 100 craftsmen introduced their folk handiworks to the visitors. Seeing happy faces of the fair’s guests, organizers are eager to arrange such event again. Moreover, this festival helps to retain Slavic national culture and unite people of the region. 09.09.2016 "Armenia" Dance ensemble is preparing new program for the Ethnic Congress that will be held in Primorsky region. 24.08.2016 First Honey Festival was held in Anuchino village.